AsiaCraft Four Line Big Bells Ghungroo Red Pads by AsiaCraft at Bass Brass. MPN: ASIA-GHUN-020. Hurry! Limited time offer. Offer valid only while supplies last. Ghungroo is a musical anklet tied to the feet of classical Indian dancers. A string of ghungroos can range from 50 to 200 bells knotted together. 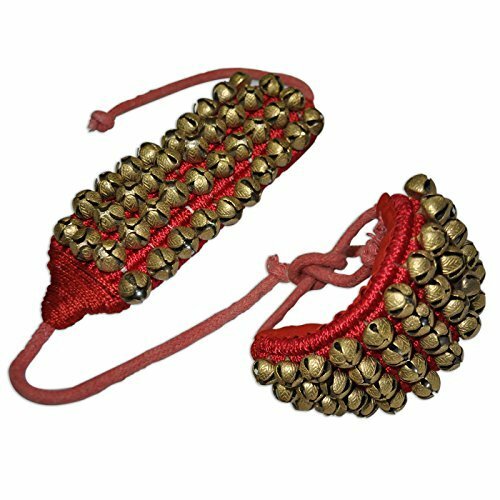 Ghungroo is a musical anklet tied to the feet of classical Indian dancers. A string of ghungroos can range from 50 to 200 bells knotted together. Ghungroos are worn in traditional performances of the classical Indian dance forms. If you have any questions about this product by AsiaCraft, contact us by completing and submitting the form below. If you are looking for a specif part number, please include it with your message.